“Maverick,” “iconoclast,” and “isolationist” are terms that historians and musicologists have frequently used to describe twentieth-century composer Harry Partch. Partch constructed his own music instruments, crafted his own tonal system, and found his artistic inspiration from non-Western musical traditions and sounds. Yet, his experimental approach to music was not created in isolation, but was fostered by his relationship to his family members during his early childhood. While Harry never published an autobiography about his life, he did eventually create an autobiographical sketch of his music in the form of two scrapbooks, which include numerous reviews of his music and theatrical works. His scrapbooks avoid mentioning any of the meaningful personal relationships that he had with his family as well as with other musicians throughout his life. However, his scrapbooks demand that we look beyond his music and writings in order to understand him as a man of many dimensions. 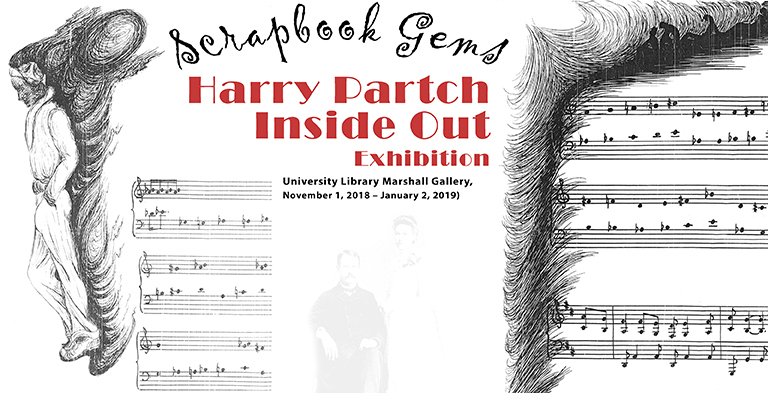 This exhibit explores the hidden gems within Partch’s personal papers to help provide a deeper perspective to his music and life from the inside out. This exhibit is part of this year’s American Music Month programming. For further information about this fall’s programming or the Center’s Partch collections please visit sousaarchives.org or call 217-333-4577.